The character of Godzilla has been a staple of Japanese cinema for over fifty years. Since the emergence of Ishiro Honda’s landmark 1954 effort Gojira, no less than 27 sequels have followed. Accounting for a quarter of this output are the films made between 1984 and 1995, known colloquially amongst Western audiences as the ‘Heisei Series’ after the ruling emperor of the period. Though they vary somewhat in quality and their rushed production values are occasionally evident, each of the five films in this collection are solid, and several are considered amongst the strongest in the franchise’s entire 28-film canon. The numerous battle sequences are cleverly staged, and Godzilla is depicted as a substantially more menacing creature than in the lead-up to the Heisei-era films. The continual threat of destruction thus features as a prominent plot device, which is more than apt given that the title character is a gigantic freakin’ monster. The special effects and bluescreen work are quite dated, though the B-movie atmosphere this engenders isn’t entirely incongruous with the subject matter, and lends an air of slightly camp, retro fun to the proceedings. Overall this is a worthwhile box set, but one containing a number of fatal flaws, not least among them the absence of the first two films in the series. As the story arc was designed to be continuous and consistent throughout the Heisei-era films, this is a glaring omission. 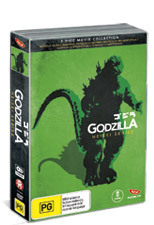 At any rate the five-disc set is satisfyingly substantial, and casual viewers of the Godzilla films and their ilk will doubtless feel the $50 price tag is warranted. Completists and more ardent fans, however, may wish to look elsewhere for the Heisei-era collection in its entirety.